With more than 35 years of experience in the music industry, the former front man for “Rock’s Gang” has once again returned to the stage to perform his tribute to Johnny Cash. Rock’s uncanny physical resemblance coupled with vocals that yield the undeniable presence of Cash provide a hauntingly realistic performance of the “Man in Black”. 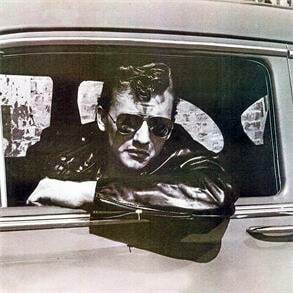 A musician and songwriter at heart, Rock has recently written and recorded two original songs in the style of Johnny Cash ……“Black Cadillac” and “9 Years, 9 Months and 13 Days” which were recorded at the same studio that produces the recordings of Dolly Parton. The past and present have come full circle at Kent Wells’ Studio in Nashville, Tennessee. Once you experience Rock Harley’s spot-on performance, you’ll wonder…..‘is it true?’ Rock has been a musician, singer and songwriter for over 30 years. Since 2009 he has dedicated his enormous talent to perfecting his tribute performance as the legendary Johnny Cash. 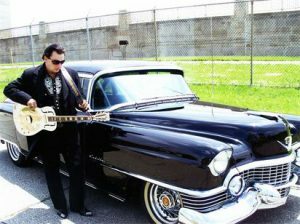 He brings not only “Classic Cash” hits such as ‘Folsom Prison’, ‘A Boy Named Sue’, ‘Cocaine Blues’ and ‘Ring of Fire’ back onto the stage in tried and true Cash style to amaze and enthrall audiences throughout the United States. 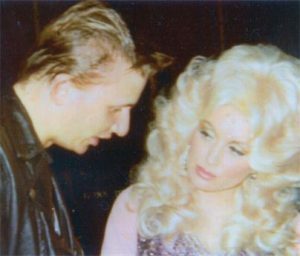 The photo below depicts Rock in days past while on the road with “Rock’s Gang” preparing to go on stage as the opening act for the lovely lady in the photo with him…the incomparable Dolly Parton!